The plans for changing the format of the EuroCup Women competition was not approved for this season. So the rules applied for the last seasons rest in place. The top two teams from each group at the end of the regular season qualify for the knock-out phase (play-off) of the competition. 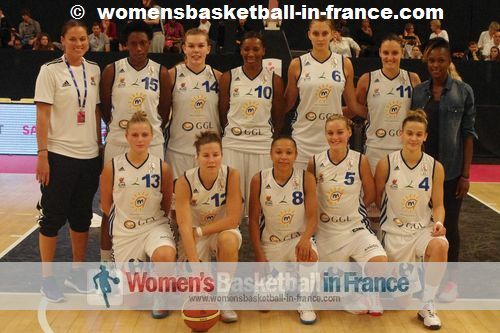 For the 2013 edition once again the Ligue Féminine de Basketball have taken up all five places allocated to France with Basket Landes, Lattes Montpellier, Nantes-Rezé, Tarbes and Hainaut Basket having played in European club competition last season. For the first round of games, the French teams were drawn away with Lattes Montpellier, Nantes-Rezé, Tarbes and Hainaut Basket all coming away with victories. Basket Landes was the only team to suffer a defeat. Lattes Montpellier beat Romanian club side CSM Satu Marein in a match that was streamed live. 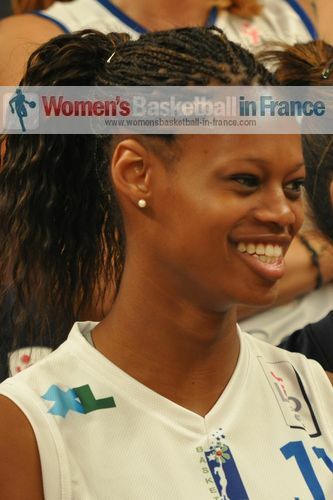 Fatimatou Sacko was in fine form for Montpellier with a game high 30 points and 10 rebounds. Ana Lelas dropped in 20 points while Géraldine Robert added 13 points and Edwige Lawson-Wade dished out 6 assists. For the CSM Khadijah Whittington was the leading scorer with 10 points. Nantes-Rezé beat TSV Wasserburg (81-68) but had their coach worried as they almost fell apart during the final quarter despite having a comfortable advantage (70-47) beforehand. Isis Arrondo led the scoring with 15 points while Carolibe Aubert had 7 assists. Basket Landes had what can only be called a "bad day at the office" as they were crushed by Partizan Galenika (57-77). The only bright light for them came from Valériane Ayayi (in picture) who led the scoring with 15 points. Partizan Galenika put up an aggressive defensive system that forced Basket Landes in turning the ball over on 21 occasions. After 12 defeats in a row in the EuroLeague Women competition last season (2011-12), Tarbes have finally something to celebrate in Europe after beating Turkish side Mersin (80-68). Angelica Robinson finally regained her scoring touch to hit 18 points as well as taking 14 rebounds to lead her team to victory. Hainaut Basket also came away from Turkey with a comfortable victory by beating Ted Ankara (82-51) with five players notching up double-digits scores. Romina Ciappina led the scoring with 20 points but was beaten to the game's top scorer by Ana Dabovic who hit 22 for the hosts. Once again just by looking at the rosters, a loss to any team from Russia at this stage of the competition would be viewed as a shock. However if one was to find out how some teams travel to EuroCup Women games and the time they actually arrive for the match then you can understand better what may seem a shock result. But the defeat of MBK Ruzomberok at home to Vilnius Kibirkstis is a surprise. The victory of BC Horizont at home to last season's finalist Kayseri Kaski Spor (78-73) should be the headline for this round. Note that only one club from Turkey won in the first round so maybe the Turkish clubs have not finalised their rosters for the season. The Lotto Young Cats from Belgium brought the first round to an end with a dramatic overtime victory (75-74) against Belarus side Olimpia with a three-ball by Lien Lentacker.